Whether you stay in Wialliamsburg, Brooklyn Heights, Green Point or anywhere else you will be afflicted by the same problem as everyone else in New York; your apartment just cannot stay clean for long enough. Build-ups of dirt and grime become a common issue for many households and stores in NYC, and it’s important that you can find the right way of cleaning this up and managing it without having to significantly eat into your own time. 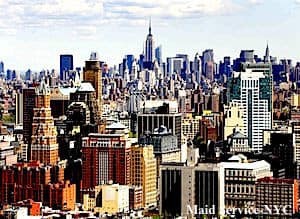 With so many different ways to keep a building clean today, though, you have many options to choose from – including professional cleaning services from Maid Service-NYC. We offer a professional and friendly alternative to cleaning on your own, offering you access to the finest possible maid teams and cleaning ladies who can dealt with just about any event or scenario. Worried that your property is falling into disrepair due to not having enough time to fix up the property and keep it clean? Then you really do have to start looking at hiring some professional services that can get the place back into a state of genuine quality. Our excellent maid services in Brooklyn can be relied upon, then, to deliver the quality that is so desperately needed. In New York, the pace of life in general can just become too much to keep up with things like domestic cleaning everyday. You might only find time to do it once or twice per month, and this isn’t really enough if you want a property that looks outstanding is capable of holding people in it all times. To avoid this problem from escalating any further, you should turn to our expert cleaning ladies for the kind of easy and effective cleaning services that you simply do not have the time to administer on your own. With our help here in New York, you no longer need to rely upon finding that one day of the month where you can do a serious clean. Now, you can use that day to relax and regain all of that energy you used up during the working week – don’t let your home fall into disrepair whilst you do this, though, we can service anyone in Brooklyn as well as various other parts of New York, making it easy for you to get the quality of cleaning ladies that you need regardless of where you are situated at the moment. With our assistance and expertise, then, it becomes so much easier to administer the kind of quality that you need to really your business up the ranks and to give you the kind of help that you need in really capturing the way forward. With our help and our advice along the way, you can make sure that living a life of luxury without having to do any of the manual labor and the cleaning up can be possible. Our cleaning ladies are ready to start whenever you are ready, so just contact us at: 212-729-4629 or e-mail us: office@maidservice-nyc.com for details today! cleaning service Bay Ridge 11209, cleaning service Bedford-Stuyvesant 11205, 11206, 11216, 11221, 11233, cleaning service Bensonhurst 11204, 11214, cleaning service Bath Beach 11214, cleaning service Boerum Hill 11201, 11217, cleaning service Borough Park 11219, cleaning service Brighton Beach 11235, cleaning service Brooklyn College 11210, cleaning service Brooklyn Heights 11201, cleaning service Brooklyn Navy Yard 11205-1080, cleaning service Brower Park 11213, cleaning service Brownsville 11212, cleaning service Bushwick 11221, 11237, cleaning service Carroll Gardens 11231, cleaning service Clinton Hill Brooklyn 11205, cleaning service Cobble Hill 11201, cleaning service Columbia Heights Brooklyn 11231, cleaning service Coney Island 11224, cleaning service Crown Heights 11225, 11213, cleaning service Cypress Hills 11208, cleaning service Ditmas Park 11218, cleaning service Downtown Brooklyn 11201, cleaning service DUMBO 11201, cleaning service Dyker Heights 11228, cleaning service East Flatbush 11203, 11212, cleaning service East New York 11207, cleaning service Flatbush 11226, 11210, cleaning service Flatlands 11234, cleaning service Fort Greene 11205, cleaning service Fort Hamilton 11209, cleaning service Gowanus 11217, cleaning service Gravesend 11223, cleaning service Greenpoint 11222, cleaning service Greenwood 11232, cleaning service Homecrest 11223, 11229, cleaning service Industry City/Bush Terminal 11232, cleaning service Jamaica Bay 11236, cleaning service Kensington 11218,11223, 11229, cleaning service Kings Highway 11229, cleaning service Kings Plaza 11234, cleaning service Madison 11229, cleaning service Manhattan Beach 11235, cleaning service Marine Park 11234, cleaning service Midwood 11230, cleaning service Mill Basin 11234, cleaning service Park Slope 11215, 11217, cleaning service Parkville 11204, cleaning service Prospect Heights 11238, cleaning service Prospect Lefferts Gardens 11225, cleaning service Prospect Park South 11226, cleaning service Red Hook 11231, cleaning service Sea Gate 11224, cleaning service Sheepshead Bay 11235, cleaning service Starrett City 11239, cleaning service Stuyvesant Heights 11233, cleaning service Sunset Park 11220, 11232, cleaning service Vanderveer 11210, cleaning service Vinegar Hill 11201, cleaning service Weeksville 11213, cleaning service Williamsburg 11206, 11211, 11249, cleaning service Windsor Terrace 11215, cleaning service Prospect Park 11215.